Forty years after the God Wars, Dresediel Lex bears the scars of liberation-especially in the Skittersill, a poor district still bound by the fallen gods' decaying edicts. As long as the gods' wards last, they strangle development; when they fail, demons will be loosed upon the city. The King in Red hires Elayne Kevarian of the Craft firm Kelethres, Albrecht, and Ao to fix the wards, but the Skittersill's people have their own ideas. A protest rises against Elayne's work, led by Temoc, a warrior-priest turned community organizer who wants to build a peaceful future for his city, his wife, and his young son. For false gods, they cast long shadows. 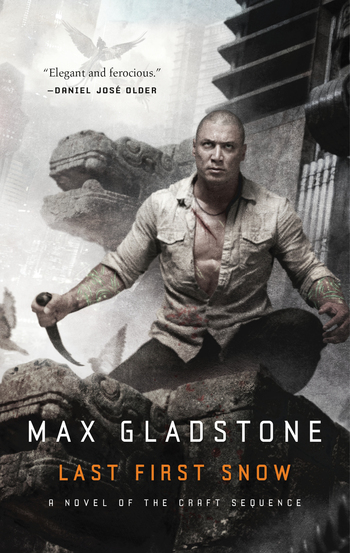 MAX GLADSTONE is a fencer, a fiddler, and a two-time finalist for the John W. Campbell Award. He is fluent in Mandarin and has taught English in China. He is the author of the Craft Sequence (Three Parts Dead; Two Serpents Rise; Full Fathom Five; Last First Snow). Max lives and writes in Somerset, Massachusetts, near Boston.